The combination of products from Alfa Aesar, Acros Organics and Maybridge enhances Thermo Fisher Scientific’s portfolio of organic building blocks, strengthens our offering of organometallic reagents and expands our selection of high-purity inorganics and metal catalysts. The extensive product range consists of the most frequently sought after organic and inorganic compounds at different purities and pack sizes for your convenience. 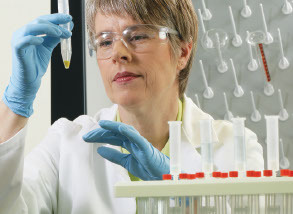 Our product offering can now provide you with the foremost range of organic, medicinal, biological chemistry, metals and research chemicals for your vital research work. Organic reagents have a wide series of applications in drug discovery, agrochemical research, flavours and fragrances, diagnostics and so much more. Inorganics include salts, metals, and substances made from single elements, most often used in applications including catalysis, crystal growth technology, photovoltaic materials, optical fibres and lasers. Synthetic Reagents are essential in synthetic chemistry, allowing transformations of building blocks into target molecules quickly, safely and cleanly. For over 50 years, Maybridge has been at the forefront of innovative heterocyclic building block and screening compound design, tailored to the drug discovery and biotechnology sector. AcroSeal is the industry leading packaging solution for the safe handling of air and moisture sensitive solvents and reagents.